We are sometimes asked the question, "Have you shot at this location before?" Sometimes the answer is yes. Sometimes the answer is no. Here's why this question really doesn't matter: photographers are artists, and like all artists we work best when we are inspired. Unlike many artists, however, documentary photographers do their absolute best work under basically any circumstances. Think about it: we are being hired to document you (the "who") experiencing a major event in your life (the "what"). The location (the "where") is a distant third in this equation. You could get married literally anywhere on earth; while you may be inspired and excited by the location, the priority in our photography is to document you enjoying it. Every couple is different; every wedding is unique by the very nature of no two days ever being precisely the same. You could copy every single detail of a wedding you find on a wedding blog and still manage to have a very different day; the weather could be strikingly different, the guests could react differently, you could be less happy with the details than you thought, leading you to look less excited than the bride in the images you saw. This is why we encourage everyone to strike out on their own path, and avoid having a cookie cutter wedding. Choose details because they inspire you; or choose no details at all if you find them boring. The most important thing about every wedding is that a couple is choosing to celebrate spending their lives together. The rest is just a big party. 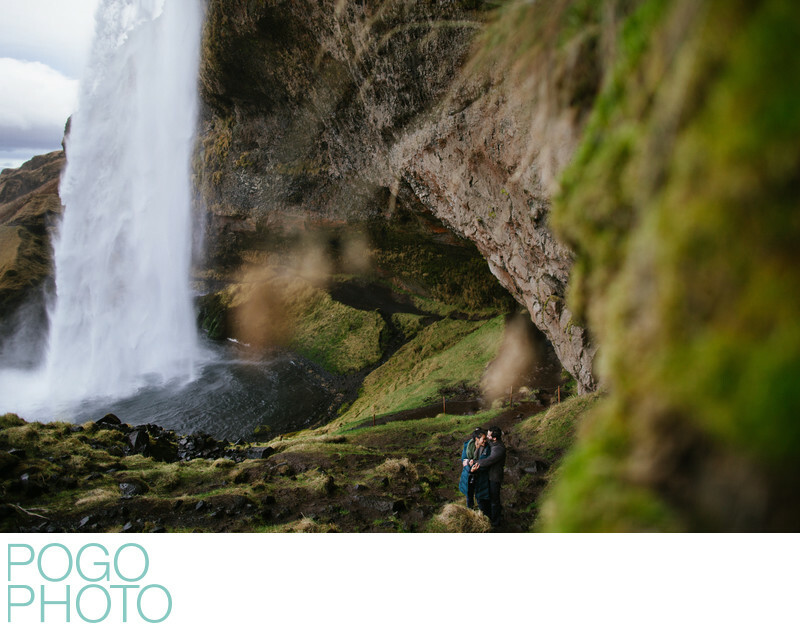 Photographing this couple in rural Iceland at Seljalandsfoss, just off the southern edge of the Ring Road was an epic challenge, but one we were more than happy to meet. Creating images that feel isolated despite being photographed at incredibly popular tourist sites requires a bit of patience, but it's completely manageable if you're willing to wait a few extra moments for wandering strangers to pass by. We loved working in Iceland, and we would happily work there again. Creating wide-angle images that are portraits that show a connection between the couple is a challenge that we love embracing, and this is an excellent example of placing a couple in a wide angle shot that still shows their love and devotion while displaying the epic beauty of the country of Iceland. 1/800; f/2.0; ISO 500; 24.0 mm.